Want to take your Stone wrapping up a notch from the Cloaked Pendant and add a few more details? 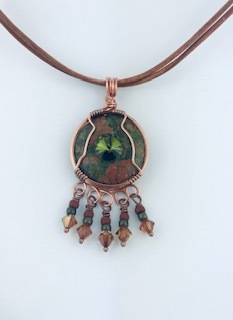 You will learn how to do the wrapped stone with some added loops on the bottom to connect dangles. This Design also has a wider bail and wider Frame. This Style is Bohemian, where the Cloaked Pendant is more classic modern so it gives you a completely different look with the Cord for the necklace. Enjoy the Design possibilities with the Donut, and the Swarovski Crystal, and the cord selection.